There was an increase in the number of students taking up higher level maths and more than 90% of the Junior Cycle cohort takes up science. MORE THAN 60,000 students will receive their Junior Certificate results today. Young people and those who returned to education will collect results in secondary schools. Minister for Education, Jan O’Sullivan congratulated the students, saying today she hoped the hark work they put into studies are reflected in the results. “I would like to thank the teachers who worked diligently with their students over the three year cycle. We must also remember to acknowledge students’ parents who supported and encouraged their children over the entire cycle and particularly in the course of the examination,” she said. 60,327 is the highest number of students to sit the exams in recent years and is an increase of 0.8% on the number last year. English, Mathematics, Civic, Social & Political Education (CPSE), Geography, History, Science and Irish are again the top seven subjects. Similar to last year, the 23 schools involved in the pilot Project Maths initiative sat exams in all give strands of the new programme. All other students sat papers which contained a significant component of it. This year also confirmed the steady increase in higher level maths uptake with 54% of learners taking higher papers – up 2% on last year. Minister for Research, Innovation and Skills, Damien English, said this improvement in the uptake of higher levels maths is a “very welcome development”. “A good base in Mathematics is essential for successful engagement with the sciences and with life,” he commented. The results will also be available online from 4pm today and anyone wishing to appeal results can do so through their school by no later than Friday 26 September. Email “More than 60,000 students will get their Junior Cert results today”. 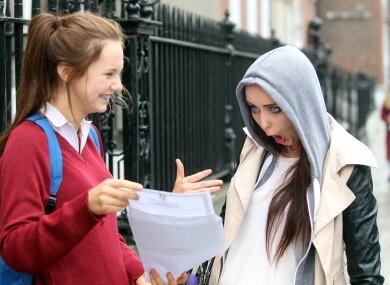 Feedback on “More than 60,000 students will get their Junior Cert results today”.